David Haney, Kent University School of Architecture, said London in the 1880s was the first “global, industrial city,” in part defined by its massive slums. Public parks were an early “instrument of social reform,” an effort to bring green space to the poor masses but urban agriculture soon became another tool for improving the conditions of the urban masses. 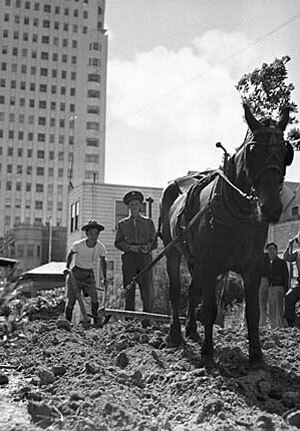 As the Salvation Army got its start, one of its first programs were “farm colonies” designed to help urbanites “take care of themselves.” In fact, urban agriculture was viewed as a way for “everyone to become self-sufficient.” Haney explained the early role of anarchist thinkers like Russian Prince Peter Kropotkin, who had been imprisoned for pushing for social reforms in Tsarist Russia and eventually became an influential social reformer in the UK, informing the ideas of Ebenezer Howard, who created the “Garden City” concept. Haney explained how early London urban agriculture communities rooted in anarchist beliefs went on to influence the growth of utopian urban farming communities in Germany. One called Eden, an early vegetarian community, is actually still a “well-known brand” in Germany. Haney thought that the idea of self-sufficiency and urban agriculture has come full-circle again, gaining traction through today’s “eco-villages.” These “intentional, small” communities may have a lineage based in “anarchist” beliefs, but are now more widespread. However, Haney doubted whether these are actually “models for urban growth,” given they aren’t planned to be part of broader urban developments. Jumping time and space, professor David Rifkind, a professor at Florida International University, zoomed in on Italy’s fascist government in the 1930’s and the role of reclamation and urban agriculture projects in their African colonies, particularly Ethiopia. The government of Mussolini was interested in the “neat organization of landscape, its segregation into districts,” which also mirrored its efforts to create a system of “hierarchy and control” between Italians and the native Ethiopians and other nationalities. Urban plans in Italy’s colonies included “symbolically-rich spatial organizations” that reinforced the idea that Italians were at the top of the heap. Ordered landscapes moved parade routes from ancient Ethiopian sites to modern Italian ones. There were separate markets for Italians and Ethiopians, with linear parks serving as barriers. The Italians saw reclaiming Ethiopian swamps — unusable yet fertile soils — as central to their effort of taming and controlling alien lands. “Tilling soils” was also viewed as an activity of the empire. Back in Italy, consuming a range of agriculture products from the colonies was viewed as a patriotic act. Rifkind showed funny images of children eating bananas from Ethiopia, being told that they were supporting the homeland through their daily breakfast. “By eating grains, fruits, oils, salts from the colonies, Italians were participating in the empire.” The Italians pushed food production in the colonies to boost self-sufficiency among the colonies as well though. With the onset of world war, Ethiopia needed to be able to stand on its own and not drain Italy of resources. Overall, urban agriculture was seen as a way to “cultivate the territories, control the local population, earn foreign capital through exports, and resettle and reform unemployed Italians sent over from the home country.” Still, Ethiopia never ended up serving the role Egypt did for ancient Rome, becoming the breadbasket for the empire. It just wasn’t a great place to grow many types of grains. In an effort to bring his rational, scientific approach to the countryside, he started corresponding with a local French farmer who also wanted to make farming Modern. Translating his Radiant City concept to the countryside, Corbu came up with the little-known and ultimately untested Radiant Farm model, which offered distinct zones with small pastures, woodlands, fields, and detailed community plans. No one would finance the project. McLeod seemed to say Le Corbusier’s “futile utopianism” was just another variant of ideological forms of agriculture that never really took off. Today, Holland’s polders, which are productive farm landscapes, communities, and woods, are threatened by climate change given they are about 10 feet below sea level. Some Dutch policymakers are already worried about increased salinization as rising seal levels pour saltwater into protected freshwater bodies. Others are thinking about whether floating barge farms will be feasible. The Dutch are worried. For professor Laura Lawson, ASLA, Rutgers University, people garden for “food and a whole lot of other reasons” in the U.S. Community is an important element, or as Lawson laughed, “drinking goes hand and hand with community gardening.” In the early 20th century, there were “vacant lot cultivation associations” designed to put unemployed workers to work. Hundreds of families were given plots as a loan, with the goal of making them self-supporting. By 1934, some 36 percent of relief food was grown in these gardens. With World War I and II, the U.S. saw the rise of war or victory gardens. In 1918, there were more than 5 million war gardens and by 1943, there were 20 million victory gardens. As an example, in Chicago, there were 2,200 acres of land donated to cultivate produce. For WW II, there were 33,000 gardens covering nearly 1,800 acres. Today, Lawson said many cities are now revising local codes to allow for urban agriculture. Land trusts sometimes purchase land, enabling communities to commit to growing things. However, even in food deserts, not everyone wants to become an urban farmer: One Detroit focus group said “not everyone has the intent or capacity to participate.” At the local level, community organizations often take the lead, given most urban farms are non-profit. Lawson argued that in these local instances, there is often a divide between the landscape architects (experts) and community organizations (grassroots). Landscape architects have been ambivalent about urban farms in the past. During WW II, many were concerned about these pop-up gardens ruining their landscape designs. This is the first in a series of posts about Food & The City, a symposium at Dumbarton Oaks. Read the second post, How Tokyo Invented Sushi. My home is roughly 10 miles from the centre of London, and it’s part of the housing sprawl that covers what is clearly shown in maps of the 1800s as market gardens. Here is where most of London’s food came from, 10 miles there and back is a day’s cart ride. That was the fundamental pre-industrial economic equation that controlled the size of cities: they couldn’t outgrow their food supply. Then the railways appeared, and food could be grown and shipped longer distances. The market gardens were concreted over as London expanded from half a million to 7 million. Our population equation has been skewed by fossil fuel energy, and no form of ‘urban farming’ is going to feed people on that scale. A picture of horse ploughing is at best ludicrous, at worst irresponsible. A horse needs about 2 acres of land to feed on, you either take the horse there, or bring the hay to the horse. No doubt the horse feed was brought in by truck. And exactly where will we find those horse-acres when we need the land for human-food? The social implications for urban farming is great. The histories recounted here help provide some context. I think what is missing from the urban agriculture discourse, or at least I haven’t seen it widely talked about yet, is the ecosystem effects. Farm plots will reduce stormwater pollution, provide cooling effects in urban areas, reduce energy consumption, provide habitat (perhaps) and help restore urban soil health. On that last point proper soil management practices need to be employed. The more organic the better, the less mechanical the planting and harvesting the better.